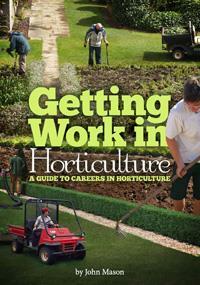 The Getting Work in Horticulture ebook explores the careers that are emerging in the horticultural industry and the kind of jobs that will be in demand in the future. Whilst a general understanding of horticultural principles and practices is required for most positions in amenity horticulture, the depth of this knowledge varies with the job role. This book is unique. It looks at where horticultural careers are heading in the future; rather than focusing on traditional jobs of the past.